one of the things i always end up hoarding and constantly having a huge collection of is perfume. since i was about 13 i've always had three or more bottles on the go. (seriously i currently have 17 and that's after i've thrown out ones i was keeping because they were gifts) before christmas, i decided to start working through them and not buy anymore until i'd finished the ones i have - one of my new years resolutions, love what you have - (which is really difficult because i am in love with dot by marc jacobs - swoon. i've been using taylor swift's enchanted for pretty much the whole of last year and up to now and it's only starting to get low (i'll be so sad when it's gone) and flora by gucci since my birthday, but i wanted something new, i stopped being able to smell the perfume myself. and while that doesn't mean you can't smell it at all, i wear perfume so i smell nice, and i want to be able to enjoy the fragrance too, so i went into my sock drawer where i keep my stash of perfume (out of sunlight so they don't spoil) and pulled out daisy by marc jacobs that i received for my birthday from a friend's mum. it's something completely different to what i'd normally wear, more floral, but i am loving it. it's subtle so you can smell it but you won't get a headache from walking past me. one thing that i love about daisy, is the bottle. man oh man, the bottle is so nice! it's elegant and girly and clean, something that gives me a sting about the taylor swift perfume is the bottle. it's cutesy and it would be perfect if i were 14, but i'm 18 (woah, four years older makes a difference, ok guys!?!?!) i'd love it if you could get enchanted in a plain glass bottle, the shape of stella but clear or all black and then clean writing on it. ah i'm getting carried about about design stuff, shush. p.s yes, i am going to pretend to be a french person in the title. imagine me sitting outside a parisian cafe with a coffee and macaroon writing this. p.p.s imagine me like that because i'm really writing this while i'm collapsed across the couch, oo la la. hahah, i love the post scripts. 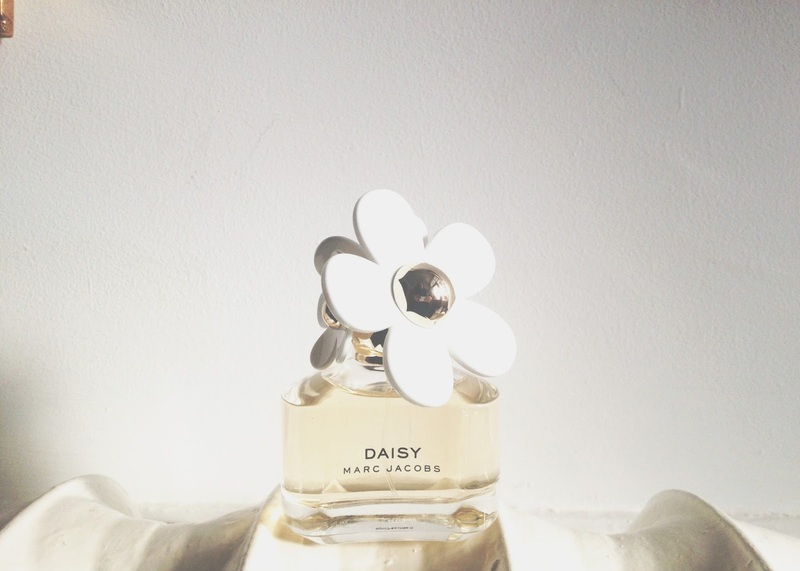 I'm actually wearing Daisy today myself! we're matching :) I also am obsessed with perfumes and recently got rid of a few that were awful and I don't know why i bought them. right now my favorites are Daisy, With Love by Hilary Duff (don't judge i love this scent! ), and Karma from Lush. I've also been wearing an Avon one called "Chic in White" very subtle and clean smelling... also crazy cheap! I've tried having one "signature" scent. But i can't do it, i always want a new one! ah good, cheap perfumes are great finds!! i am a daisy lover also! i am onto my second bottle. i had no idea what to do with the first bottle once i finished it - it's so pretty! i ended up throwing it away in an effort to reduce my excessive hoarding, but it seems like such a waste! what do you do with your empty perfume bottles? my staple perfume at the moment is fantasy by britney spears - its a cheapie i know but i always get so many compliments from it! i honestly throw mine away. the ones i love the most normally have the nicest bottles so i'll have the bottle again when i repurchase! ah that's the perfume that smells like my friend! (aka her signature scent) but i know what you mean, it smells so nice! and even nicer when you see the ££! This is an amazing perfume!